The Environment Agency have sent additional water pumps to Cumbria to prepare for more potential flooding over the next couple of days. Our region is preparing itself for flooding as a month's worth of rainfall is expected to over the weekend. There is an amber warning issued for the Border area as the remnants of tropical hurricane Kate hit is due to hit our region this afternoon. Eight inches of rain is due to fall on Cumbria over the next 24 hours causing rivers and streams to overflow their banks as many areas of ground are already saturated. The Environment Agency in England has one flood warning in place at Keswick Campsite where flooding is expected and two flood alerts for the Upper River Derwent, Stonethwaite Beck, Derwent Water; and the Rivers Brathay, Rothay and Winster. In Scotland, the Scottish Environment Protection Agency has issued a general flood alert for Dumfries and Galloway and the Scottish Borders. 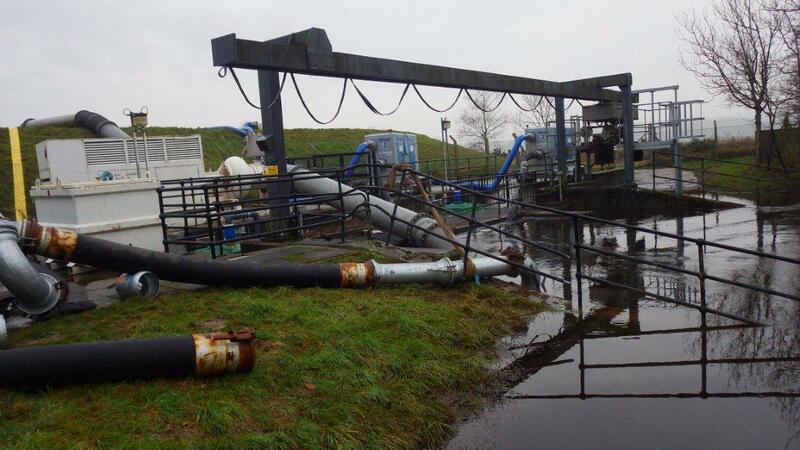 The Environment Agency in England has brought two 24-foot long, high-volume flood water pumps from their depot in the South West. They are capable of pumping 120,000 litres of flood water per minute. Environment Agency teams are today continuing to check flood defences as well as clearing blockages in watercourses, and preparing some temporary defences. River levels across northern England are already high and are expected to rise with this further heavy rainfall, bringing with them a significant risk of flooding. We are working closely with the emergency services and partners to prepare ahead of the weekend. The Environment Agency says it carried out more than 30 patrols to catch people fishing illegally in Cumbria and Lancashire over the May Bank Holiday weekends. It's a particularly bad time, because May falls within the coarse fishing 'close season', when coarse angling is suspended on rivers, streams, and specified canals and stillwaters to protect spawning fish. During the two Bank Holiday weekends, Agency staff carried out 61 visits to waters across Cumbria and Lancashire, served more than 62 report forms for illegal fishing, and checked more than 628 anglers for rod licences. Our enforcement teams have been in out in force – particularly over the last couple of bank holidays – and will continue to be over the coming months. The number of anglers caught red-handed is testament to how seriously we take illegal fishing but worryingly it shows a blatant disregard for the law and the health of fisheries. A bypass to ease Kendal's traffic woes?